June 4th, 2010 09:45 AM | by William Bell | Victorious Eschatology. What is Victorious Eschatology? Great question. Victorious eschatology characterizes what the eschatological goal was all about. It was about gaining or achieving victory, never to be defeated again. It is about the complete dominion over the enemies of God so that a Christian can live with the blessed assurance and confidence of their walk in Christ today. They need not fear those enemies. Let’s consider them, but first let’s discuss defeated eschatology. When I speak of the defeated eschatological paradigm, I speak of the views that regard the Sin, the Law, the Satan and the death as yet being operable in the life of a Christian. It is the view that the kingdom (rule and reign of God) over the Law, Sin and Death has not yet arrived. Therefore, one cannot live in victory. It is the view that man upon death and even while he lives is under the burden and consequence of sin, particularly the sin of Adam which was magnified and perpetuated through the covenant of Moses, (Rom. 5:14, 19-20). The primary reason for defeatism endtime views is the application of physical concepts to spiritual realities. The spiritual is denied in order to accentuate the physical. Once we shift from the realm of the Spirit to that of the physical, we cannot but wind up with defeated eschatology. Who has escaped physical death? Not one! Therefore, no one has victory is their logic. These are the paradigms of Amillenialism, Premillenial Dispensationalism, Historicism and even Partial Preterism. Time and space will not allow us to speak further but let us focus on victorious eschatology. Victorious Christian Eschatology is the Biblical teaching of the end time that sets forth a real end time that ended in the past. It is not a long drawn out perpetuated endtime that never ends such as is advocated in the views above. All of them are yet hoping and waiting for an end time which they feel promises them “ultimate victory” therefore, they yet live in “ultimate defeat.” This is a sad state of affairs for a Christian eschatological view. Paul wrote to the church at Rome saying, “For sin shall not have dominion (rule or reign) over you for you are not under the Law, but under grace. (Rom. 6:14) The sin, personified as a burdensome taskmaster does not reign over a Christian. Christ died to “put away sin” (Heb. 9:26). He completed that atonement at His imminent return, (Heb. 9:28; 10:37). It is only because men choose not to acknowledge that Jesus has come in victory, that they hold on to the sin dominated eschatological doctrines. If the last enemy to be defeated is death, and if that death is physical, then any view of eschatology which awaits deliverance from physical death is under the dominion of death. Further it demonstrates that Christ’s death has to date been ineffective in accomplishing its goal. That alone is reason enough to abandon such a view. The only reason death is undefeated is because sin is undefeated. And if sin is undefeated the cross is made of no effect! Thus, the gospel, according to this thinking could not do any more than Moses’ Law, i.e. perpetuate sin and death. As we’ve indicated above, death was the last enemy to be destroyed. However, Jesus said that if a man keeps his saying, he would never see death. (John 8:51-52). Let’s examine that for a moment. Now, when would man never see death? If this is referring to a time after Jesus’ return, then would that not mean that the only time one can “keep the saying or words” of Christ is after he returns? Man certainly sees physical death now. Does that not put the cart before the horse? In that I mean that one gets freedom from death, then they keep the saying of Christ. But why would one need to meet the condition or requirement of keeping that saying if in the futurist view, they received freedom from death at the alleged end of time? This would only mean (and to which I have no real objection) that man must yet remain faithful after he is delivered from death. But that is not what Jesus said. He said, if a man keep my saying he shall never see death. The emphasis is on the future, as a result of meeting the condition of the present, namely, keeping (obeying) the word of Christ. Now, we ask, why are people yet dying physically if this is what Jesus meant? Why do people have life insurance, burial policies, paid up burial plans and grave plots if they believe Jesus’ words apply to physical death? Death as the subject of victorious eschatology has never been about sustaining or resuscitating the physical body. Death is relational. It is separation from the Father, (Isa. 59:1-2). A man can be the healthiest physical specimen alive and yet be “dead as a doornail” spiritually speaking. As Paul said, “the woman who lives in pleasure is dead while she lives.” (1 Tim. 5:6). Death extends not only to this physical world but to the nether world, i.e. to that of Hades. Jesus promised that the gates of Hades would not prevail against the church, (Matt. 16:18). Hades was man’s enemy because even in death, he was not free to enter the presence of God, (Acts 2:34). Thus, Hosea promised/prophesied that God would ransom man from the power of Hades. “O Hades I will be your plagues! O Grave, I will be your destruction! Pity is hidden from My eyes. (Hos. 13:14). Please note the personal pronouns. God said “I” will be the destruction of Hades. That is He, particularly Christ is the “resurrection” (John 11:25). That means if we’re in Christ, Hades is defeated. Yet, futurism yet awaits deliverance from Hades. Thus, according to them, it continues to prevail over the church. Paul taught the Law entered that the offense –the sin, might abound, and thus sin reigned in death being strengthened by the Law, (Rom. 5:19, 20). He speaks of that identical point in 1 Corinthians 15 saying, the “”The sting of death is sin, and the strength of sin is the Law.” (1 Cor. 15:56). But again, if we are not under “The Law” why are we yet under “sin and death?” This is a question futurist eschatology cannot satisfactorily answer. Why do we yet die physically if we are not under Moses’ Law? The Law could not take away sins. If it could, salvation, victory, defeat of death would have been by the Law. “For if there could have been a law which could have given life, verily righteousness (life from the dead) would have been by the Law.” (Gal. 3:21) Again, sin has no dominion over those who are not under the Law but under grace. Why then do those in Christ whom sin cannot rule and reign over die? The victory of Christ is one where “nothing” neither physical death nor physical life” can separate us from the love of God which is in Christ. (Rom. 8:38). It is sad that so many believe they live under the power of Satan. “The-devil-made-me-do-it-syndrome” is alive and well even in so called charismatic churches who believe, erroneously, that they have the power to cast out Satan. Why do they keep letting him back in? But, the goal of victorious eschatology was the imminent defeat of Satan. “For the God of peace shall crush Satan under your feet shortly, (Rom. 16:20). God did that when Christ returned in A.D. 70. There is no bogey monster chasing Christians. They are imagining these demonic ideas as a direct result of their failure dominated eschatology. Victorious eschatology is the complete and total victory achieved through Christ’s death, resurrection and return. Christ returned in A.D. 70, thus death, the last enemy, sin, Law and Satan are now defeated totally. The Christians walk is a walk in life (spiritual life). As long as they walk in Christ, they cannot die for they live in The Resurrection, i.e. in Christ, (Luke 20:35; John 11:25). Full preterism is the only eschatology doctrine which fully honors the completed victory achieved through the cross of Christ. Learn more on the study of Christ’s return. 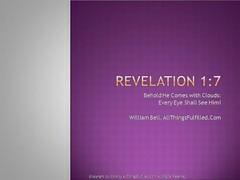 Our study on Revelation 1:7, provides easy to understand, in depth application and commentary on this challenging verse. Yes, send me the Revelation 1:7 study today.